Voters fill out their ballots on Tuesday at the polling place in the Aspen Room at the Lake Tahoe Community College. 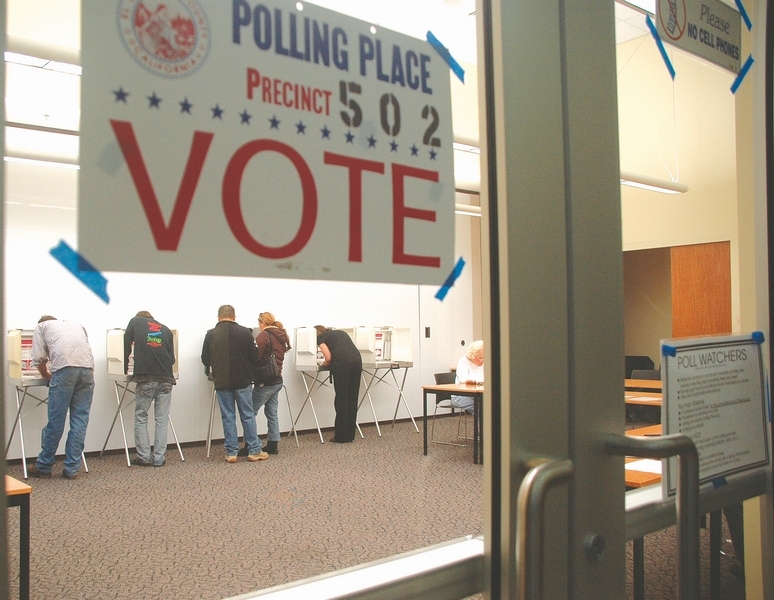 Though there are many ballots yet to be counted, El Dorado County’s clerk estimates voter turnout could climb to about 50 percent, which would be a 10 percent increase from the 2014 primary. About 23,000 ballots are yet to be verified and counted, according to a statement from Recorder Clerk William Schultz issued Thursday. Historically, El Dorado County’s voter turnout has been higher than the state average in both primaries and general elections. In 2014, the county’s primary turnout was 40.08 percent while the state’s was 25.17 percent — a record-low turnout — according to data from the California Secretary of State. The 2014 general election saw just 42 percent. The initial county report, filed early Wednesday morning, cited a 30.28 percent voter turnout with 34,483 votes tallied. These numbers will increase as votes continue to be counted. According to the county clerk’s office, 87,711 mail ballots were issued in El Dorado County. In addition to the ballots being received by mail, about 8,800 ballots were submitted at the poll centers, and many more are yet to be received. Mail ballots can be received up to three days after the election as long as they are postmarked no later than Election Day. County officials have until July 5 to finalize the election tally, following a canvass process to certify results. Experts cite a number of factors that influence voter turnouts. About 73 percent of California’s eligible voters are registered, which has stayed mostly the same in recent years, according to the Public Policy Institute of California. Lack of interest is the most cited reason (36 percent) for registered voters to opt out of voting, while eligible voters who aren’t registered said it was because they had low trust in government (30 percent). In the mid-20th century, California boasted some of the highest voter turnouts in primary elections. Between 1950 and 1966, an average of 63 percent of registered Californians voted in the primaries. Mindy Romero is a political sociologist and director of the California Civic Engagement Project (CCEP) at the University of California Davis. She said lack of media coverage and public support in the primaries can mean some voters don’t get all the information to make an informed decision, a problem that is exacerbated in youth and minorities. Eight percent of eligible California voters between the ages of 18 and 24 voted in the 2014 general election, according to the Secretary of State. Romero said young people aren’t given the skills to know how to vote and why it’s important to their community. According to the United States Election Project, Americans with post-graduate degrees have voter turnouts upward of 40 percent higher than those who didn’t finish high school. As of 2016, 92.6 percent of El Dorado county residents had high school degrees while the state average was 82.1 percent, according to the U.S. Census Bureau. Chris Nolan is the founder of Spot-On, an ad buying service specializing in political and advocacy efforts. She said part of what mobilized voters in 2018 is the way campaigns are embracing new avenues for advertisements to reach a wider demographic.